Police resume their search for a man missing following a massive weekend fire at the Prince George, B.C., airport. Investigators have not determined the cause of the fire that destroyed a hangar at Prince George airport in British Columbia. 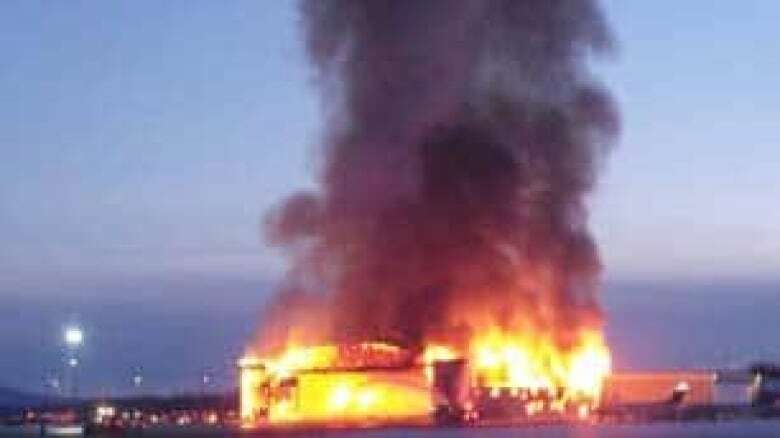 ((Sumbitted by Steven Kostamo))Police resumed their search early Monday for a man missing after a massive weekend fire at the Prince George, B.C., airport. Investigators got a preliminary look at the ruins but have not yet conducted a thorough search for the man, 53, whose car was found outside the gutted remains of a wooden, Second World War-era hangar that was destroyed on Saturday. The hangar belonged to Northern Thunderbird Air, a charter company with 70 employees and 11 aircraft. The cause of the fire has yet to be determined, RCMP Sgt. Al Steinhauser said. In a news release Sunday, the company praised hangar staff, who scrambled to move eight parked planes, including an air ambulance, out of the way before flames destroyed the building. "Due to the quick thinking of our employees on site, we are able to continue operations without interruption," the company said. Bill Hess, the head of the firm, said Monday that his employees combed the hangar for people before it was engulfed by fire. He was shocked to hear a person might have been trapped inside. "That was a bit of a surprise to us, because my understanding was the employees on site had done a bit of a sweep for anybody that was there," Hess said. "And because there was so much time from the point of when the fire was reported to where it was desperately out of control — it was well over an hour. "It just seemed really odd. … We thought we had all those bases covered. It was quite a shock to hear." Criticism was levelled at airport fire personnel, who watched the blaze while waiting for city firefighters to arrive. "Our concern is the airport itself — the aviation side [airplanes], not the structures," Daryl Mulder, the airport fire chief, said Monday. "The city looks after the structures." Prince George firefighters arrived within half an hour, including Chief Jeff Rowland, who said the airport's fire crew isn't trained or equipped to battle building fires. "You could turn your hoses on it, but it wouldn't be that effective," Rowland said. "You don't want to send people into a situation that's dangerous like that if they don't have the equipment and they're not trained." There is no money to base city firefighters closer to the airport, Rowland said. "This is a big loss, a tragic loss, but I don't think you can justify having a fire hall out there. Northern Thunderbird Air said it has been able to maintain service despite the destruction of the hangar, which housed the company's head office. "People and assets have been re-distributed amongst our other bases in Smithers and Vancouver as well amongst local businesses at the Prince George airport," the company said. "We are working with the Prince George Airport Authority to process our passengers through the airport terminal in conjunction with our sister company, Central Mountain Air. "Passengers who are scheduled to arrive, depart or transit Prince George on any of our flights are asked to check in at the Central Mountain Air kiosk in the main terminal." All inquiries will be handled through the company's Vancouver office. "All Prince George phone numbers have been forwarded to Vancouver so feel free to contact us in the same manner that you are accustomed," the news release said.